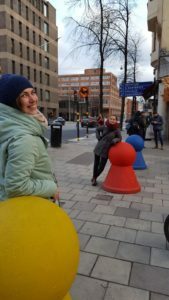 Anita Reith and Anna Szilágyi-Nagy had been studying the opportunities of crime prevention through environmental design. They started to interpret the problems of a popular party street in the Netherlands, in the city of Eindhoven. Namely, that thousands of people occur to be there at night, while the street becomes completely abandoned for the morning, which benefits crime. DITTS is a Dutch association, which’s main target is to make the street safer for the day, thus making its economy raise. So they were ’experimenting’ with the method on this specific street. 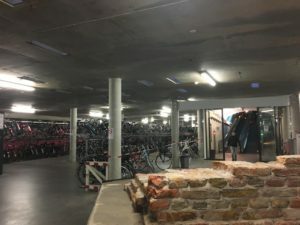 For the Dutch cities the problem of storing bikes is also an essential question since bicycle is one of the most frequently used vehicles there. This problem was solved by specially envisaged underground bike sheds and safety cameras. Second day’s station was Stockholm, where our team was guided by a society specialized in crime prevention through environmental design, emphasizing the eco-quarter of the city, which being not only the most sustainable part of the city, but also great example of well-functioning crime prevention. 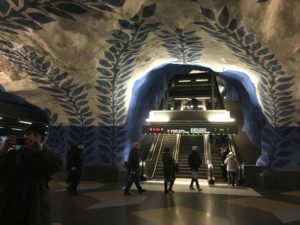 Further interesting solutions can also be found there, for instance the artistic underpasses, which are making the underground walk less frightening.